Is a software application that offers a standardized environment for development and integration of geospatial capabilities, military symbology and command and control (C2) concepts in custom software applications. Allows programmers and technology integrators new software developments of command & control (C2) alike applications (as well civilian applications for emergency situations, fleet management, logistic operations monitoring and control) without the need to study and learn specific GIS and military/defence technologies. All of them are already encapsulated in user friendly business and simple software concepts, ready to be used in applications, giving the developers the freedom to focus on the business logic of their applications. 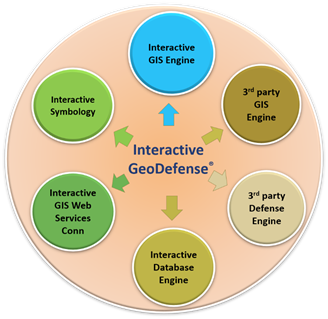 Strong GIS, defence symbology and C2 operational elements that can be always used, which are regularly updated upon GIS industry trends and NATO standards.